Loaded with features, Scorpion offers the striking combination of style, comfort and safety. Adjustable length and ratcheting temples offer customized fit. 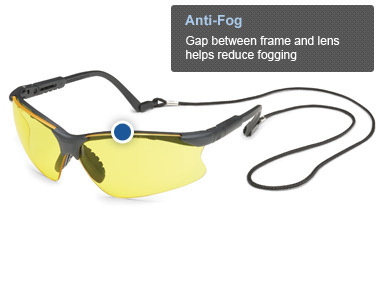 Gap between frame and lens minimizes fogging. Free “Scorpion’s Tail” retainer helps prevent loss and damage. Independently tested and certified by Underwriters Laboratories to meet ANSI Z87.1+ and CSA Z94.3 standards. Meets ballistic impact resistance requirements for eyewear in US Military Performance Specification MIL PRF-32432 (GL). Also available in a bifocal version as Scorpion MAG and a small version in Scorpion SM!